In spring the fundatrices of Prociphilus bumeliae and Prociphilus fraxini are brown, covered with white wax wool, and form loose leaf-nests on their primary host, usually ash (Fraxinus species). 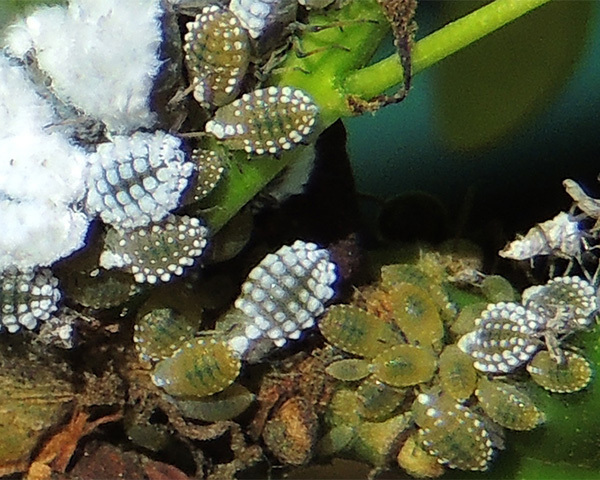 The first image below shows a mature colony. Prociphilus bumeliae and Prociphilus fraxini both have distinct wax glands on the head and thorax, as well as large, albeit indistinct wax glands on the abdomen. The 5-segmented antennae are about a third of the length of the body. There are no siphunculi. Images copyright Dr László Érsek, all rights reserved. Alates (see second picture above) have a blackish-brown head and thorax, and a light brown or yellowish red abdomen, more or less covered with white wax wool. The 6-segmented antennae are about half the length of the body. Prociphilus bumeliae and Prociphilus fraxini can only be distinguished at the alate stage produced in the leaf nest. In the Prociphilus bumeliae alate the third antennal segment is more than five times longer than the second antennal segment. Also the head has only a pair of posterior dorsal wax pore plates which are conspicuous as clearly defined pale areas much larger than the ocelli. In the Prociphilus fraxini alate the third antennal segment is usually less than five times longer than the second antennal segment. The posterior wax pore plates on the head are ill-defined, but there is usually a pair of small clear anterior wax pore plates. Both these Prociphilus species host alternate from ash (Fraxinus) to fir (Abies). Prociphilus bumeliae sometimes also uses privet (Ligustrum vulgare) or Common lilac (Syringa vulgaris) as a primary host. The fundatrices colonize the base of the primary host. Their offspring feed on the young shoots and petioles inducing the formation of leaf nests often high in the trees. These develop into alatae, which migrate to the roots of fir. In October sexuparae develop on fir, and migrate back to hawthorn where the sexual forms are produced. Both these aphids may also form colonies on the bark of the stem or branches (see picture below), rather than leaf nests. Image copyright Dr László Érsek, all rights reserved. Prociphilus fraxini and Prociphilus bumeliae are usually densely covered with wax. The white patches of wax mark the positions of the wax glands. 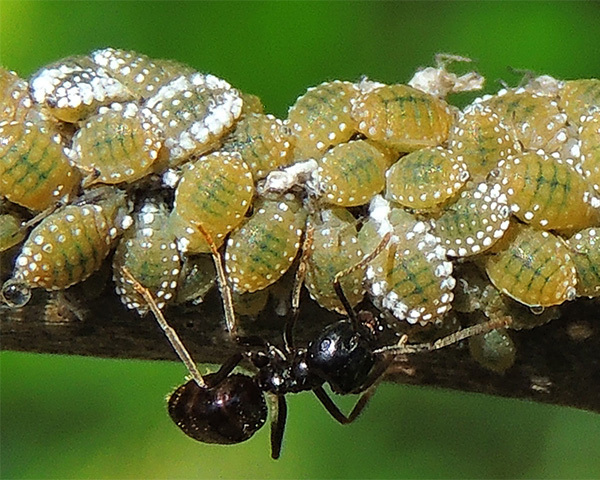 Wax protected aphids are usually not ant-attended. However, these two Prociphilus are sometimes ant attended. When they are, Way, 1963 reported the ants remove the wax - a surprising observation given wax is repellent to most insects. It seems more likely these two Prociphilus, like many other wax-covered aphids, simply cease wax-production when ant attended. If the ants really do remove it, then we have to ask why they should do so. Perhaps the wax has some nutritional value for the ants, or possibly wax may diminish the aphid honeydew responses to tending by the ant. 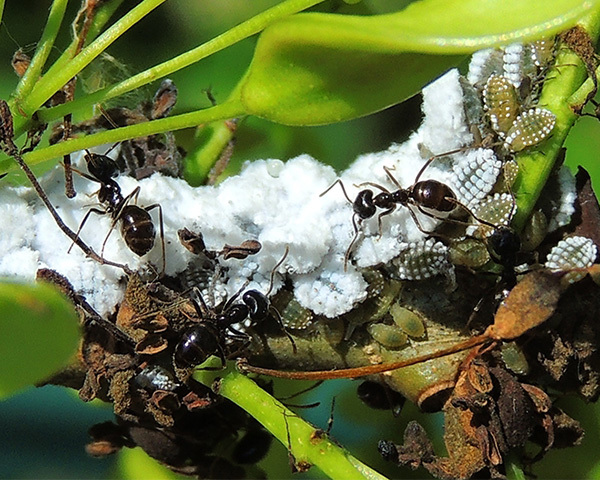 The picture below shows ant attended Prociphilus, with much of the colony still densely coated in wax. 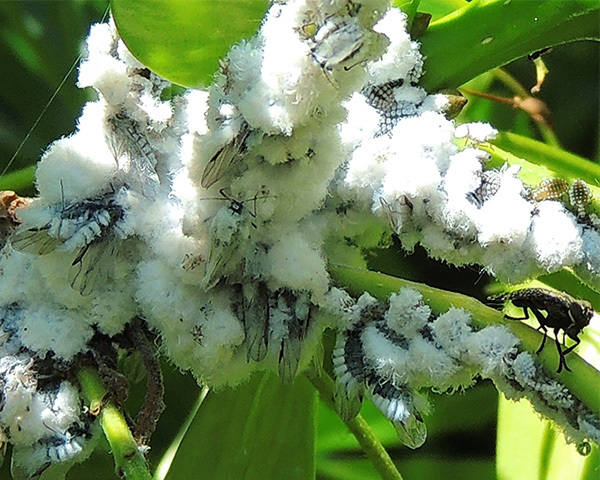 The picture below shows another part of the colony which has rather little wax, presumably removed by the ants. Prociphilus fraxini and/or Prociphilus bumeliae have been recorded from 4 Fraxinus species (Fraxinus angustifolia, Fraxinus excelsior, Fraxinus mandshurica, Fraxinus ornus). Blackman & Eastop list only 9 species of aphids as feeding on ash worldwide, and provide formal identification keys for aphids on Fraxinus. Of the 5 species on European ash (Fraxinus excelsior) Baker (2015) lists two species, Prociphilus fraxini & Prociphilus bumeliae, as occurring in Britain, both of which are dealt with on this page. Blackman & Eastop list 6 species of aphid as feeding on privet (Ligustrum vulgare), all of which Baker (2015) lists as recorded in Britain: Aphis gossypii, Macrosiphum euphorbiae, Myzus ascalonicus, Myzus ligustri, Myzus persicae and Prociphilus bumeliae. 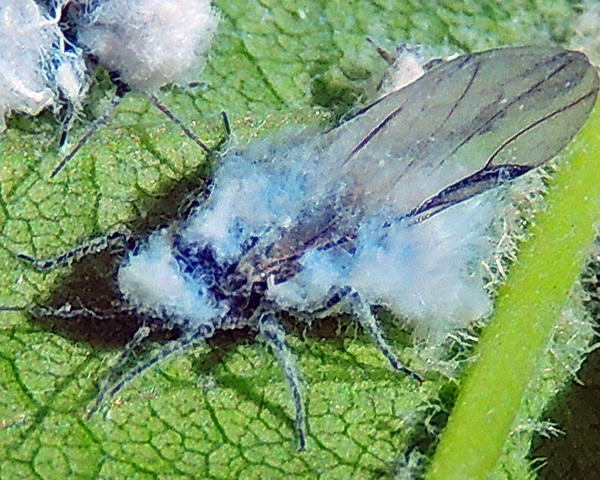 Blackman & Eastop list 5 species of aphid as feeding on common lilac (Syringa vulgaris), 2 of which Baker (2015) lists as recorded in Britain: Myzus persicae and Prociphilus bumeliae. Prociphilus fraxini and/or Prociphilus bumeliae have been recorded from 7 Abies species. Blackman & Eastop list 47 species of aphid as feeding on true firs (Abies species) worldwide, and provide formal identification keys. Of those aphid species, Baker (2015) lists 11 as occurring in Britain: Adelges nordmannianae, Adelges pectinatae, Adelges piceae, Cinara confinis, Cinara curvipes, Cinara pectinatae, Elatobium abietinum, Prociphilus bumeliae, Prociphilus fraxini, Prociphilus xylostei and Mindarus abietinus. We especially thank Dr László Érsek for the images shown above.